Recently I mentioned that the young parrots at my house had been given new names. This created a few puzzled responses from folks. I thought I would elaborate as I now know a bit more about how the new names were chosen. The double yellow headed Amazon parrot was previously called Joker. His name was given by the breeder with the thought that it might be changed at some point by the folks at his new home at the Kaytee Learning Center. This was the same situation for the blue throated macaw formerly known as Jackson. The staff at Kaytee had a brainstorming session and came up with some clever ideas. Joker’s new name is “Wrigley” as in Wrigley’s double mint gum…..double yellow headed Amazon…get it? Jackson’s name was changed to Beni, because this is the name of the region in Bolivia where blue throated macaws are found in the wild. This macaw species is quite endangered. Connecting his name to the plight of his wild cousins can help raise awareness to parrot conservation. So there you have it! Beni and Wrigley. I have to admit their new names have grown on me. Who Wants a Parrot that Talks? Everyone! Well, sometimes it seems that way. 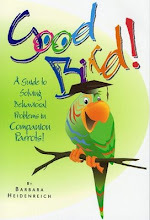 One of the popular requests I receive is for information on training a parrot to talk. The truth is there is no guarantee that you can get a parrot to talk. Otherwise we would think of great talking parrots as a dime a dozen and everyone would have one. 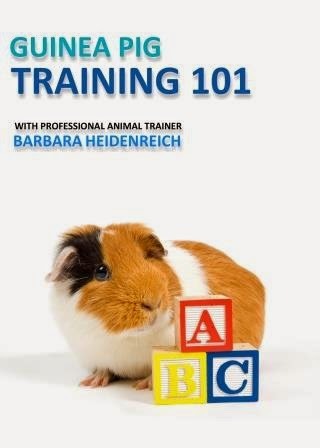 You can be a great trainer, but part of the equation is the bird and its learning history. If you are one of those people who has a parrot who is trying to copy sounds, all I can say is “Woohoo!” You have it easy. All you have to do is create the situations in which your bird is likely to make a few sounds, reinforce and then put the sounds on cue. One of the parrots staying at my house for some training is a double yellow headed Amazon parrot, newly renamed “Wrigley” (Yes, Jackson and Joker have new names. Jackson is now Beni and Joker is Wrigley) Wrigley is already showing an interest in talking. One thing that helps is that my yellow naped Amazon parrot Delbert talks up a storm. So Wrigley hears Delbert’s phrases and sayings throughout the day. This morning when Wrigley stepped onto my hand to come out of his cage he blurted out “How are you!” I must admit I had a little tingle in my stomach. It is exciting when a parrot starts to pick up sounds you like. And one of my training mantras is “if it happened once, it will happen again” I suspect I will be hearing a lot more of our Wrigley in the days to come. 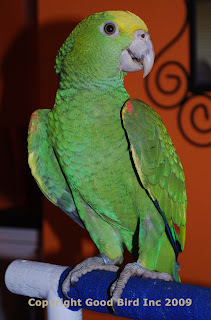 Those of you who do have parrots that talk probably have noticed that they often get chatty when there is a loud continuous sound such as the vacuum cleaner or water running. This is a great way to encourage your parrot to vocalize so that you can reinforce sounds you like. Here is a little video clip of Wrigley practicing his various sounds with the vacuum running in the back ground.....and a slight interruption from Beni. Enjoy! How much do I love this behavior? Let me count the ways. 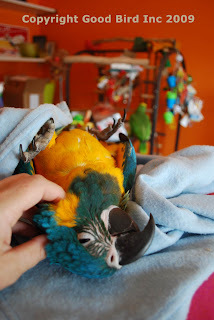 Training a parrot to look forward to being wrapped in a towel has become one of my favorite behaviors to train. I think in part because I know most parrots at some point in their lives will likely be wrapped in a towel for a medical procedure. Knowing that I can reduce stress that may be part of that situation by using positive reinforcement, makes it easy to add this behavior to my list of training goals. 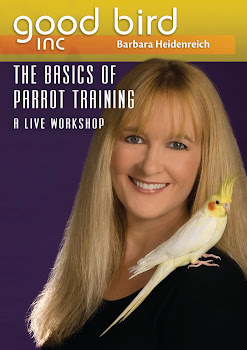 In my DVD Training a Parrot for the Veterinary Exam, I go through the approximations of training this behavior with a yellow collared macaw and also a hybrid macaw. Both were re-homed birds who had a history of unpleasant experiences with towels. 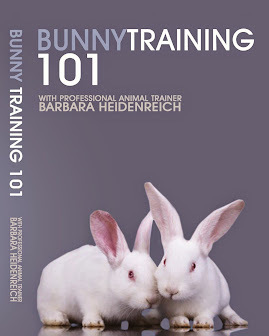 This makes it a little more challenging to train the behavior, but certainly not impossible. It just means taking it slower, using smaller approximations and of course lots of positive reinforcers. And as you can see in the video, both birds learn towels are now associated with good things. One of the great things about working with young parrots, is often they have not yet been exposed to things in a way that might create a fear response. Both Jackson and Joker, the young parrots at my house, have seen a towel. But I have been very careful to make sure all towel encounters include positive reinforcers. Joker thinks towels mean you get to roll around on your back and play with toys. Jackson thinks towels means you will get your head scratched for a nice chunk of time. My own yellow naped Amazon parrot, Delbert will fly to a towel if he sees one in your hand. He has had so many pleasant experiences associated with a towel he can’t wait to get into one. 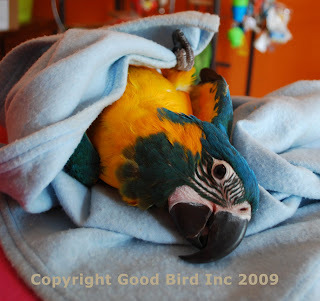 People often ask what happens to all that great training when you go to the veterinarian and the parrot is restrained in the towel for a not so pleasant procedure. Will a traumatic experience cause the behavior to fall apart? The answer is “It depends.” If the experience is extremely difficult, the bird may need to be retrained on the behavior. However if you bird has a very long history of positive reinforcement with the towel, one not so great experience will probably not cancel out the plethora of wonderful times he has had in the towel. Of course the best approach is to train the behavior to the point that actual restraint in the towel is not a problem for your parrot. Jackson and Joker are well on their way towards that goal. Joker the yellow naped Amazon parrot made me proud today. 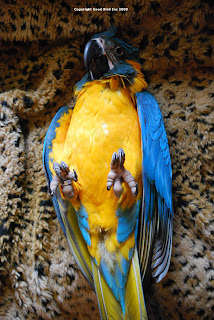 As mentioned in an earlier blog, both Joker and Jackson the blue throated macaw showed some hesitancy in returning to their cages after a few hours spent outside their cages training and playing. With some positive reinforcement training Jackson got back on track rather quickly. Joker was a bit more challenging. This is because he primarily works for food treats. While play, toys and attention can be good reinforcers for him, when the behavior is a tough one, treats are by far the best solution in his case. However this means timing training sessions for when he is most receptive to a goodie. Jackson on the other hand will do practically anything for a head scratch at most anytime. Usually when I open Joker’s cage door, the first thing he wants to do is stretch his wings and fly around for a bit. I usually wait until after he has expended some of the energy before seeing if he is interested in a training session. However this morning he stuck around the cage, while I removed bowls, cleaned, etc. “I thought to myself “Hmmmmm, maybe this is a sign he is ready for a session right now.” I pulled some treats out of my pocket and sure enough he was ready for some training. We went through a number of repetitions of him entering the cage for a treat and exiting for no treat. What made me so proud was that instead of leaning away or even sitting upright, he began leaning towards the cage door as if to say “Hurry up! I want to get inside that cage!” I love it when positive reinforcement creates a parrot that is an eager participant, one that can’t wait to do the behavior because he knows it will result in great consequences. This is also Joker’s response to a crate as well. He almost can’t wait to go inside one. Even though at the moment training sessions are timed for when Joker is most interested in treats, overtime that will be less important. All those excellent training sessions will add up and Joker will learn returning to the cage, or entering a crate anytime you are cued is worthwhile. Working in free flight bird shows for so many years, you quickly learn or develop techniques to work with more than one bird at a time. At one zoo where I consulted we flew 17 macaws together as a flock. They all lived together in one giant aviary. But we taught them all to wait on perches to be cued to step up. Otherwise we had 17 birds flinging themselves at us in hopes of getting a treat. Yes positive reinforcement can be pretty powerful. But when used to reinforce what you want, you can change chaos to cooperation. Training two parrots I suppose is a cakewalk compared to 17. But even so, training more than one bird at the same time presents some challenges. With the two flighted baby parrots at my house, one of the challenges is that one bird, Jackson the macaw, is always looking for a cue that might mean he gets to come over and get a treat or get some attention. This means poor Joker, the Amazon parrot, gets the short end of the stick if I am not careful. If I cue Joker to fly to me and Jackson sees it, he will try to get to me first and make sure there is no room for Joker. To address this I look for moments and situations in which Joker can see my cue and Jackson can’t. 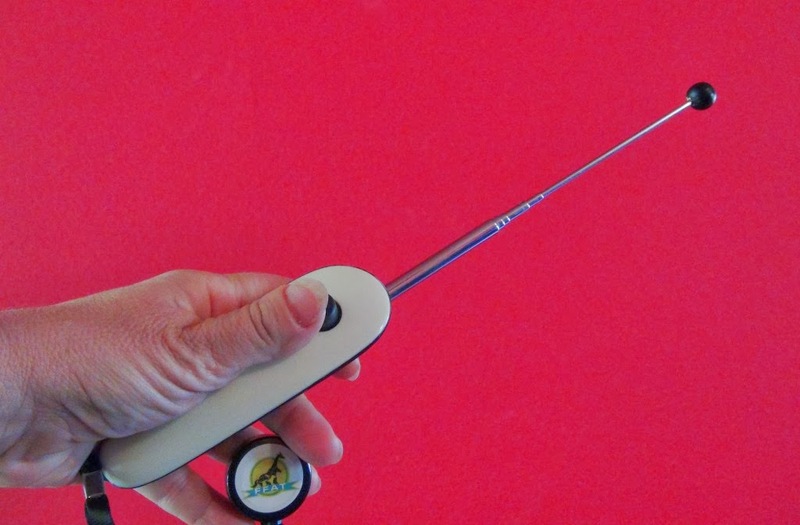 I also look for ways to reinforce the bird not needed at the moment for staying put. For example, I might get the macaw engaged in playing with a toy, or reinforce him with treats for sitting calmly nearby while I work with the other parrot. When I work with Joker on entering a crate, I reinforce Jackson for sitting on my left hand. Joker walks into the crate on his own and I can reinforce him with my right hand. Both parrots are relaxed and comfy and earning reinforcers for doing behaviors I want. If I only need Jackson, usually Joker can easily be redirected to some fun toys as seen in the photo above. Some people opt for only working with one bird at a time. This is certainly an excellent option. However I found that one bird will pace if left in the cage and ends up being a big distraction to the other parrot. Therefore having them both out and reinforcing one for staying out of the way, or training while one is preoccupied has worked well for these two parrots. I think that is the inner dialog I have whenever I am working with Jackson. But seriously look at that bird! How cute is he? Makes a person just want to play with parrots all day long. Doesn’t it? Believe it or not, this is a behavior I am training Jackson to do. (Not look cute. He does that on his own.) What I am training him to do is lie on his back. He actually learned to do it in record time. I will explain the steps I used to train this behavior. Jackson will step up readily. He enjoys sitting perched on my hand for attention, treats and head scratches. With Jackson perched on my hand I started the behavior by gently bringing my right hand towards his back. I reinforced him for remaining calm and relaxed. Sometimes I reinforced with a treat and sometimes a head scratch or cuddle. Overtime he became quite comfortable with my hand resting on his back. The next step was for me to bend slightly at the waist and support Jackson’s back with my right hand. I then straightened back up and offered him a treat. This method allowed Jackson to experience being on his back in tiny increments of time. Eventually I extended these intervals to about 30 seconds. At this stage I wanted to work towards having Jackson hold this position without having his feet hold onto my left hand or using my right hand to support his back. This meant moving to the couch as seen in the picture. This time when I bent over, he rested on my palm on the couch. Overtime I was able to slide my hand out from under him. He also began to gradually loosen his hold on my left hand with his feet. This allowed me to cover him with head scratches which he adores. Next thing you know, Jackson doesn’t want to move from his new favorite spot on the couch. Ah, the power of positive reinforcement!